The Perseid meteor shower occurs every year in August. 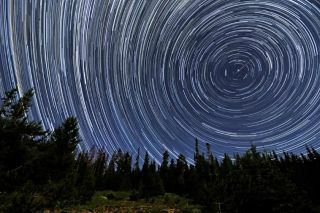 Meteor showers are some of the most popular skywatching events each year, and 2012's lineup of celestial light shows is already expected to be more impressive than last year. A meteor shower occurs when Earth travels through specks of debris from comets or asteroids. These pieces of dust and debris hit Earth's atmosphere at scorching speeds and disintegrate in flashes of light. This is why meteors are often called "shooting stars," because of the way they streak across the sky. So, what is the best way to watch a meteor shower? The key is to have a dark sky. For urban skywatchers, this means getting as far away from dense city centers and light pollution as you can. Ideal conditions for viewing a meteor shower include a clear, unclouded night sky with little to no natural moonlight. Most meteor showers get their name from the constellations from which they appear to streak (though the constellations are not the actual source of the meteors). When we look down this path, we are looking at the so-called radiant. For example, the Perseid meteor shower, which peaks every year in August, appears to originate from the constellation of Perseus. Meteors from November's Leonid meteor shower appear to stream from the constellation of Leo. Another tip is to simply use your naked eyes. When watching a meteor shower, there's no need to use a telescope or binoculars because they will limit the amount of sky you can see at one time. Pick a dark patch of the sky, but don't necessarily fixate on one specific spot. "Relaxed eyes will quickly zone in on any movement up above, and you'll be able to spot more meteors," NASA officials said in a statement. "Avoid looking at your cell phone or any other light. Both destroy night vision. If you have to look at something on Earth, use a red light. Some flashlights have handy interchangeable filters. If you don't have one of those, you can always paint the clear filter with red fingernail polish." Notes: A waxing gibbous moon will set at about 3 a.m. local time, allowing for several dark-sky hours of observing before dawn. This shower has a very sharp peak, usually only lasting a few hours, and is often obscured by winter weather. The alternate name for the Quadrantids is the Bootids. Constellation Quadrant Murales is now defunct, and the meteors appear to radiate from the modern constellation Bootes. Photographer Gary Rader caught this Perseid meteor west of Wichita, Kansas, on August 13, 2011. Notes: With the second-fastest entry velocity of the annual meteor showers, meteors from the Orionids produce yellow and green colors and have been known to produce an odd fireball from time to time. Notes: The Leonids have not only produced some of the best meteor showers in history, but they have sometimes achieved the status of meteor storm. During a Leonid meteor storm, many thousands of meteors per hour can shoot across the sky. Scientists believe these storms recur in cycles of about 33 years, though the reason is unknown. The last documented Leonid meteor storm occurred in 2002. Notes: The Geminids are typically one of the best, and most reliable, of the annual meteor showers. This year's peak falls perfectly with a new moon, guaranteeing a dark sky for the show in the nights on either side of the peak date. This shower is considered one of the best opportunities for younger viewers because the show gets going around 9 or 10 p.m.